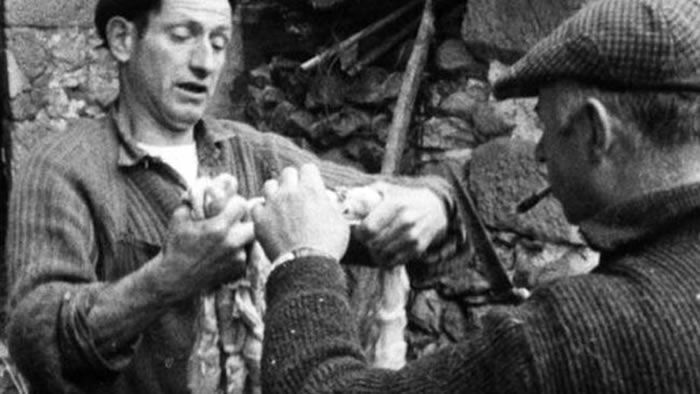 The two films in this programme depict two very different styles of food preparation, each of which is specific to its environment. Though formally quite similar, the circumstances of their making are distinctly varied. Food follows a day in the life of a communal restaurant in New York’s downtown art scene, whereas Le Cochon records the traditional slaughter of a pig in a remote French village. Both date from the early 1970s but while Matta-Clark’s film could almost be a contemporary report from any cosmopolitan city, Le Cochon documents a phenomenon of rural life that can rarely be experienced by outsiders. Curated by Mark Webber for 25FPS. The pig’s life on screen is short lived – she is quickly despatched by a swift cut of the throat, but then it takes five men the best part of a day to prepare the meat. Most of them smoke constantly throughout the process, which is undertaken with an air of calm assuredness. There appears to be an economy in their artisanal activity – each has his role, and they’ve been doing it this way all their lives, as have their ancestors before them. The butchering takes place on a bed of straw in the yard. Nothing is wasted. The head is removed, and the blood and intestines are saved for traditional delicacies, the rest cut into joints. Inside the house, two men clean the intestines on the kitchen table before they are cut into equal lengths and used for sausages. It snows. Bread is delivered. In the evening everyone celebrates with wine and song. The farmers talk to each other as they go about their business but no subtitled prints are known to exist. According to co-producer Luc Moullet, their dialect is so strong and parochial that much of what they say is intelligible to native French speakers. Jean Eustache’s distinctive and uncompromising films are either documentary or semi-biographical fictions, frequently pertaining to aspects of provincial life. Often associated with the French New Wave, he made only two features, of which Le Maman et la Putain is the most well-known. He was born and raised in Pessac in the suburbs of Bordeaux in 1938, and committed suicide in 1981 after sustaining serious injuries in a car crash. Matta-Clark’s film situates the process of food preparation in New York’s Soho at the beginning of the area’s gentrification. In the early 1970s, factory units in this former industrial zone were reappropriated as live/work lofts and art spaces in a process of inner city renewal which has since been repeated in many urban centres. Food is again at the centre of social exchange – this time in the form of a collective restaurant that served up home style cooking to all-comers but essentially functioned as a hub for a growing network of artists. Caroline Goodden was the owner and de-facto manager; Gordon Matta-Clark designed the space which occupied a corner storefront. His innovative (though not necessarily practical) design provided a central ‘stage’ for cooking and preparation, one of New York’s first open kitchens. Its roster of chefs was drawn from artist groups such as the Trisha Brown and Grand Union dance companies, the Phillip Glass Ensemble and Mabou Mines theatre troupe. On Sundays, guest chefs including Yvonne Rainer, Robert Rauschenberg, Keith Sonnier and Donald Judd cooked their specialities. Over 100 people worked in the restaurant during the first six months. The film begins early morning at the fish market. Back at the restaurant, fish and duck gumbo is prepared and dairy products are delivered. During evening service, simple meals of salads or sea bass and cucumber are served as an accordionist entertains. After closing, the place is cleaned and bread is prepared for the following day. The camera floats freely through the action, stopping occasionally for comments from customers. Photographer Robert Frank was responsible for much of the filming and can occasionally be seen holding the microphone. Gordon Matta-Clark made approximately 20 films, most of which document his performances or architectural interventions. He was born in New York in 1943 and died in 1978. In the decades since his death, he has been increasingly acclaimed as a key figure whose work presages many aspects of contemporary art practice.